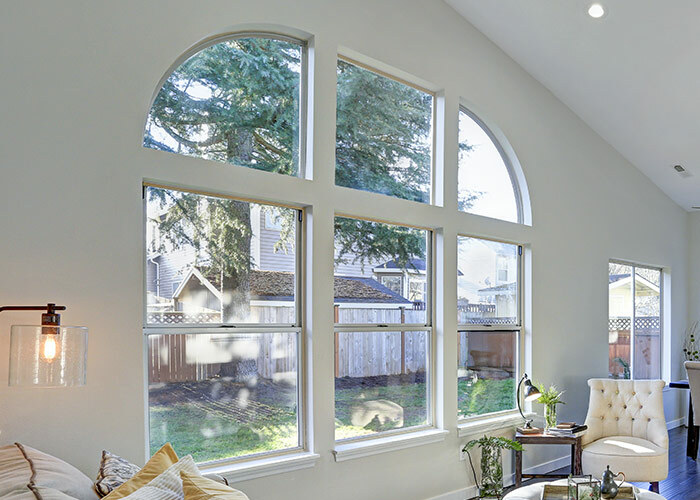 For those who are looking for something a little bit different, we offer a number of specialty windows, including round, half-round, triangle, oval, arch, and trapezoid. A strategically placed specialty window is the perfect way to add your own personal touch to your home and make it uniquely yours. Furthermore, certain architectural styles such as gothic or Tudor can be greatly enhanced by the addition of arched or vaulted windows. While specialty windows are generally non-operational, they can be further customized with various decorative glass to enhance their beauty and appeal. At West Shore Home, we’re committed to making home improvement as convenient as possible for our customers. This means faster follow-ups to customer inquiries, scheduling same-day appointments to get your project rolling as soon as possible, and completing all window installations in a single day. No matter which specialty windows you decide on, they will be installed by our highly trained technicians, so you can be confident that the job will be done right the first time. And to make things even easier, we offer a number of flexible financing options for approved homeowners. West Shore Home. Let’s get this done. Our expert window installers proudly serve the cities and surrounding areas of Pittsburgh, Harrisburg, Lancaster, and Tampa. Crafted using the latest developments in UV protection and heat gain reduction, our windows feature 11 microscopic layers of spectrally selective metal coatings that let in the natural light you want while filtering out ultraviolet rays and the heat that comes with them. When it comes to windows, ENERGY STAR® is the new normal. But here at West Shore Home, we like to stay on the cutting edge. That’s why our windows are engineered to not only meet, but also surpass the most recent ENERGY STAR® requirements. If you want to reduce your home’s carbon footprint, your windows are a great place to start. Designed and built for the eco-conscious consumer, our windows can significantly lower your home’s CO2 output. With innovative insulating spacers that regulate the surface temperature of the glass, our windows help your home maintain a constant temperature, which will keep you and your family warmer in the winter and cooler in the summer. No time to wait? No problem – Contact us today and we’ll get started on your window replacement project right away. A design consultant will come to your home, establish a game plan, and give you a quote on the spot. We’ll have your windows installed in just one day. Because drawn-out home improvement projects are a thing of the past. The installers were a pleasure to be around. They kept the work area very neat and clean answered any questions that were asked of them. Very knowledgeable about the product and explained what they were doing during the replacement of the windows. Install by Roland and John H was superb. Arrived on time, took care to protect our home while working and cleaned up every speck of dust when new windows were in. West Shore kept us informed every step of the way and clearly valued us as customers. Very satisfied with our new windows and highly recommend West Shore. Today one of our windows and one of our doors was serviced. The installer Mike S was here and both items were taken care of very quickly and efficiently. I also loved how thorough he was in checking all the rest of our doors and windows, making sure nothing else needed work. Thanks for another great experience with your company. Dino S. and Shawn A., did a wonderful job of installing our 7 windows today. They arrived on time, were extremely courteous, took great care to ensure that no damage was done to our home and they answered my many questions to our satisfaction… We could not have asked for a better team to do the install. Kudos to them both!! Double your refund is equal to 20% off the project price with a max discount of $5,000. New order only, financing with approved credit. Some restrictions may apply, see sales representative for details.